Do you wake up in the morning and eat a breakfast that does not sustain you throughout the day, or even hold you over until lunch? Most of Americans, and most of my clients, skip breakfast all together or eat something rather unhealthy as they are in a rush and on the go. As your parents must have told you once in your life, “Breakfast is the most important meal of the day.” As a health professional, I agree with that sentiment. My theory is you should eat like a king for breakfast, a lord for lunch, and a peasant for dinner. Meaning you have your biggest and most nutritious meal of the day in the morning followed by a modest meal for lunch, and a small, yet satisfying dinner. It is important to never go to bed with a full stomach if you are dealing with weight loss or other health, and sleep issues. What if I told you that in less than 25 minutes, you can make a fat powered meal that you can eat for breakfast to power your day, and to also bring to work with you so you can have the leftovers for lunch. Every morning, it is important to start your day with a high dose of fat if you want to optimal cognitive and physical performance. That is why bulletproof coffee is such a rage. I suggest most people avoid grains, and especially gluten in their breakfasts. Breakfasts with grains increase your blood sugar and creates the sensation of craving, shortly after eating. But sometimes your body is in the mood for something a little heavier, and heartier, and in that case, quinoa is a solid option. That is why I suggest my power packed avocado, and curried quinoa Buddha bowl. It is easy to make and it will fill you up for the entire day without any sense of craving or lack of energy. 1.) Boil 1 ¼ cup of water and 1 cup of quinoa. 2.) Add 1 tbsp. of coconut oil, 2 tbsp. of turmeric, 1 tbsp. of cayenne power and 2 tbsp. of curry powder. 3.) Once the water begins to boil, chop up some garlic and let the contents of the bot simmer and cover. Let cook on low for 15 minutes. 4.) Open the lid, take a hefty spoonful of Coconut oil and pour it on top of the quinoa and immediately put the top back on. 5.) On a cutting board, cut an avocado in half, and use your fingers to peel off the skin of each avocado half. 6.) In a separate skillet, put a tbsp. of coconut oil and fresh, chopped garlic on the pan. Once it is hot, scoop a large spoonful of quinoa onto the sizzling pan. 7.) Add 2 tbsp. of turmeric, 1 tbsp. of cayenne power and 2 tbsp. of curry powder to the quinoa. 8.) Add in pumpkin seeds and pine nuts to the quinoa and cook on medium for 4-5 minutes. 9.) After the quinoa is slightly crispy, place into a bowl. 10.) Add the avocado half on top of the bowl, and garnish with a small handful of sesame seeds. Could you imagine that eating a delicious, and satisfying meal for breakfast could equate to you taking a day’s worth of vitamins? This breakfast is filled with vitamins and nutrients that will help you power through your day, and help build the foundation toward a healthy, and vital lifestyle. Everyone knows how healthy avocados are for you! Avocado’s are filled with the good type of fat! And remember, “Eat Fat, Get Thin”. An avocado contains more potassium than bananas and they are loaded with heart-healthy monounsaturated fatty acids, which are great anti-inflammatories. Avocados also contain vitamin K, folate, vitamin C, vitamin B5, B6 and vitamin E. Avocados can be eaten in a myriad of ways, but adding them as a centerpiece on top of your Buddha is just genius to me! When you add pine nuts to this dish, you are giving yourself a boost of energy with the extra dose of protein. Pine nuts are also great for your eye health because they contain beta-carotene and antioxidants. Lutein, found in pine nuts, allows the eye to filter UV light, which can aid in preventing macular damage as well as preventing the aging process of our eyes. Pine nuts are also a great source of monounsaturated fats that are good for lowering cholesterol. Adding pumpkin seeds to this delicious masterpiece, you are adding a dose of heart-healthy magnesium and zinc, for overall immune support. Pumpkin seeds are great for your overall health and liver function, and they also contain tryptophan, which helps in aiding sleep. Quinoa is a grain, but when eaten in moderation, it can be used as a potent superfood to implement into your diet. As a protein is concerned, quinoa is the best vegetable protein you can get. It is a complete protein, containing all nine of the essential amino acids. Quinoa contains almost twice as much fiber as most other grains. To live a healthy lifestyle, eating a lot of fiber is crucial! Quinoa also contains lysine, magnesium, vitamin b2 (riboflavin), as well as manganese, which helps protect to mitochondria as well as red blood cells free radicals. 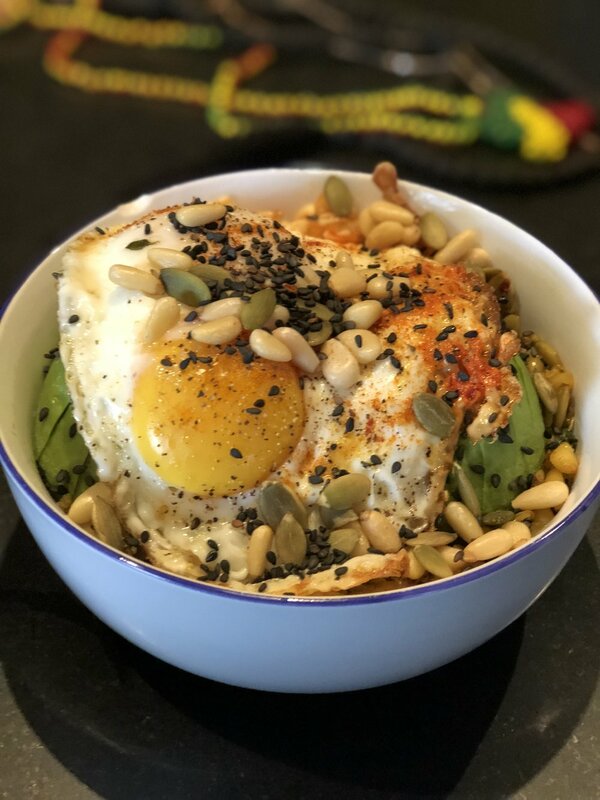 For those of you who want this dish to be a non-vegan option, I suggest adding an egg friend to perfection (over easy) on top of the bowl, for extra nutrients, and flavor. We all know how good eggs are for us now don't we? As a society, we do not think eggs are that healthy. Ask all of your health conscious friends, or even vegan friends, what they think about eggs. Most will eat egg whites only. Egg whites are the least nutritious part of the egg. The yolk of an egg is a power plant of nutrients and healthful benefits. Eggs yolks contain vitamin A, D, E, B12, K, riboflavin, folate and iron. People think the egg yolk is what raises your cholesterol, but that myth has been debunked years ago. The white of the egg or essentially just a solid source of low-calorie protein, and a source of low efficiency energy. The deep, beautiful and profound yellow of the yolk is actually a wonderful way to get your daily dose of vitamins and minerals. This dish is packed with other healthy and nutrient-dense ingredients including quinoa (in moderation), coconut oil, MCT oil, sesame seeds, turmeric, and cayenne power. Could you imagine you imagine that eating a delicious, and satisfying meal for breakfast could equate to you taking a day’s worth of vitamins? It sounds a little crazy right? As a people, a human race, this is how we should be eating. This is how we should be saving the planet. One fork at a time. Who doesn't love Mexican shredded chicken (Pollo Tinga)? One of my favorite dishes is my slow cooked Pollo Tinga. You can dress it up in a burrito, you can make tacos or enchiladas with it, or you can have it on top of a salad, that is if you are trying to be health conscious. Chicken is delicious, but sometimes it can be hard to make. Have you ever gone over to someone’s house and they either undercooked, or overcooked your piece of chicken? It can be a disgusting experience and it can ruin an entire evening. Let me teach you how to make this idiot-proof recipe that will make every one of your family and friends begging for seconds. 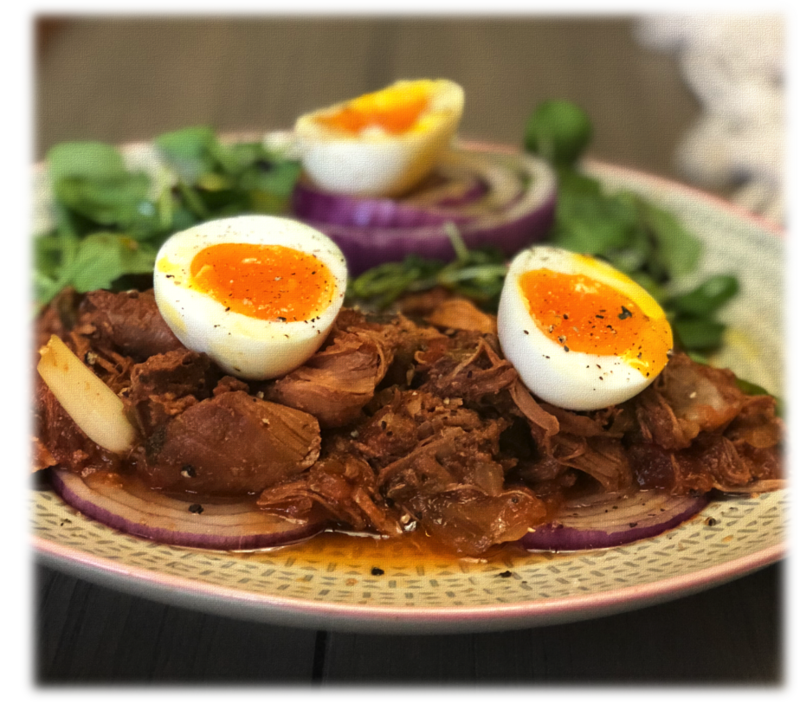 This Pollo Tinga watercress salad will not just have you loving life, but it will inspire you to cook for larger parties and dinner functions. 1.) In a slow cooker (crockpot) place a pound of rinsed chicken breast and chopped onions, peppers, cilantro and green onion. 2.) Pour a bottle of salsa on top of the chicken, and add fill up salsa bottle with water and pour into crockpot. 3.) Add fresh corn kernels (chopped with a knife) to the crockpot, and add a healthy pinch of salt and pepper. 4.) Let cook on high for 8 hours, and stir the chicken with tongs until it shreds. 5.) Boil water with salt, and olive oil. 6.) When water is boiling, cook eggs for 6 minutes and 50 seconds so that they are soft boiled. 7.) Place in freezing cold water, and begin to peel the eggs. 8.) On a plate, slice up 3 red onion steaks and add a handful of watercress as the bed of the dish. 9.) Add two spoonful’s of the pollo tinga onto each red onion steak, while the chicken is still hot. 10.) Slice up the soft-boiled egg, and garnish them on top of the dish. 11.) Pour a cap full of olive oil on top of fresh watercress and salt and pepper to taste. This dish contains a handful of superfoods that are extremely complimentary to your health. Between eggs, red onion, and watercress, this salad is a power punch of nutrition that can help you push through your day without hitting any walls. Red onions, especially raw red onions are extremely healthy for you. Red onions, or purple onions have around 1.5 mg of fiber in a 1/2 cup serving. They are also rich in particular flavonoids called anthocyanins. Anthocyanins help neutralize free radicals that create havoc and plunder and pillage your healthy tissues and cells. Flavonoids aid your body and immune system in many ways, including protecting your heart from disease as well as reducing the risk of a constellation of cancers. Red onions are also rich in vitamin C, which is vital in boosting and sustaining a healthy immune system. Watercress is extremely healthy for you. Watercress is filled with manganese, calcium and antioxidants, like flavonoid beta-carotene, zeaxanthin, and lutein which protects the lung and mouth from cancers. "We all know how good eggs are for us now don't we? The deep, beautiful and profound yellow of the yolk is actually a wonderful way to get your daily dose of vitamins and minerals." If you use free ranged chicken, you are using high quality protein, and a healthier source of meat that is hormone free and better for your overall health. This dish is really one of the easiest things you can make, it takes just a few minutes to put everything into the crockpot. If you do it the night before, you get to wake up to an already finished product. You get to have the chicken for lunch, or dinner, while leaving it on warm all day, until you return home to enjoy dinner with entire family.